Thank you for sending the spoilers but I'm not ready to use those yet. I want to see if I can crack this myself so I'll keep trying it. That's ok. I'm just not sure what other hints I can give you to help. The problem with this Age is that once you know the secret, the age is solved. You just need to hit the right buttons. Which makes coming up with hints to help you really hard. I'll poke around and see if I can't figure something out though. This symbol is everywhere. It's on the walls in the tunnel, it's in the Cathedral. It's even on the liking book in your Relto. Can you be more specific about the cloths? To stay inactive you said I need to use the cloths by the door. Are talking about one door or all 3 doors? I know when I first opened the door I was in misty. Do I understand that once I link back to Relto I now am "active"? And the same with using the cathedral? I can only advance forward to and through space to get back to water. I end up having to link to Relto to get my cloth there. So that makes me "active" right? I would then need to start over in the tower to make myself "inactive"....I'm confused. I don't want to spoiler you, but when you opened the door, you were not in misty. Thinking that you were may be misleading you. As for active and inactive, I think you're getting hung up on terminology. The Active version is simply the version that you link to when you use the linking panel on the linking book. Either the one in your Relto or the one in the Cathedral. Inactive is any version that is not that. If you link to Water Ahnonay, that means that both Misty and Space are inactive. If you use the lever in the tower to advance the Age, the Water Ahnonay is now inactive. You can confirm this by liking to your Relto and back. You will find yourself in Misty Ahnonay, which is the new active version. For my comment about the cloths. Do some playing around to see exactly how they work. How do they interact when you are jumping from version to version? Think about how they might help you navigate this Age. You've already used them to help you get inside the tower. Think about how exactly that all worked. The only other hint that might help you is the Watcher Journals (or whatever they're called). They're a bit obscure and extremely cryptic but maybe they'll give you that extra hint. Scattered around I'm sure you've seen these numbers formatted like this 3:54 on pieces of paper stuck to the walls. Those correspond to the Watcher Journals in you Relto (the blue books with the guy's face on them). The first number is the book number, and the second number is the line number. So after going in circles all this time I finally tapped out and did the spoiler alert. Only then did I realize that I needed to swim back to the tunnel after pulling the lever in the tower. And, believe me, I tried to do that several times but I always ended up going back over the falls. Suddenly it dawned on me that the wheel in the tower calms the water so I can swim back to the tunnel. I wish I had thought of that sooner!! Long story short that door is open again and I'm on my way again. P.S. I now know what all those pieces of paper stuck on the wall mean. Thanks for your help. Well, we tried. As long as you understand how it all works, that's what's important. I think Ahnonay is one of Cyan's most cleverly designed Ages, but the hints are a bit lacking at times. Let us know when you get to the end. you know now that I have gone through the door, down the ladder, and took the tram to the end. Here I found a new cloth, a new shirt, and a control panel with symbols on it like the spinning blocks in the gallery. The tram makes no other stops and I don't see any side tunnels to explore. I found no other clues to as to my next move. My question is; could these clues be found in other shell books? Would I mess myself up if, say, I try the book that links you directly to the cathedral and go and touch that link book? If you have touched the cloth that's beside the vogondola ("tram"), behind the locked door, then you will be able to get back there unless you touch another Ahnonay cloth. But you will need to take the ride again to get back to the control panel. I opened the door to the round room. Inside I opened the big panels looking out onto the waterfall. Does that control panel also activate the cog mechanism next to the control panel? The cloth inside leads me to a room likely under the round table that's in the middle of the room. The paper by the window looks like it has that room and it is connected somehow with the mechanism next to it that looks like a giant timer. I'm still playing with that. 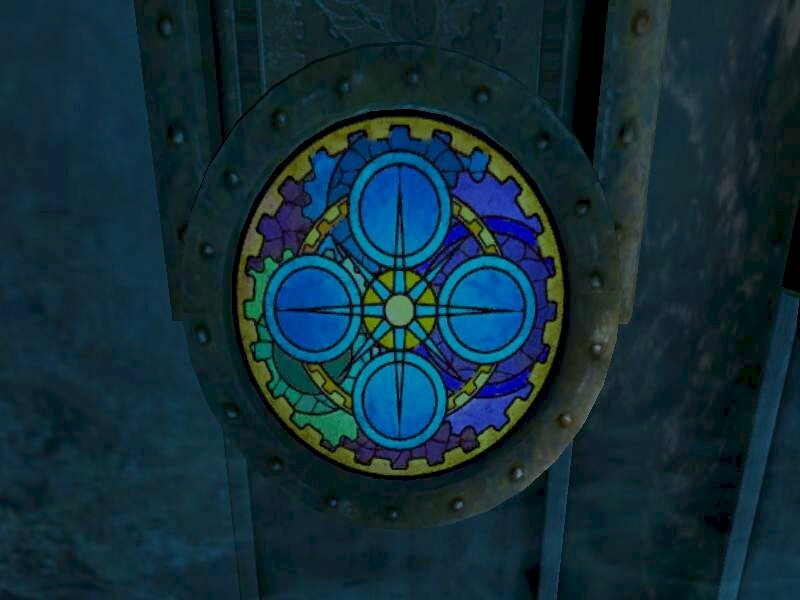 In the meantime I have linked to all 3 worlds one at a time and then going back to the tram to look out the big round window. To my surprise the tall stature with the ball has disappeared and now I see each world in view. Still exploring. There's a few things of note here, but the main thing is the liking stone to the Bahro cave. There's not much you can do there now. Just be sure to touch the shell cloth so you can get back here quickly from you Relto. Why don't you explore the other Path of the Shell Age: Er'cana. Is the Bahro cave where I am looking out at the waterfall? If so I have touched that cloth there. The shell age: Er'cana is where? I don't know the names of the different places so please bear with me. I have explored the other shell books like the shell room linking to Ahnonay and to the train. The other book puts you in the cathedral linking to Ahonay. Still haven't discovered anything different as of yet. And the Great Zero has the glowing shell there also.